The image above was taken at the start of the 2012 Vendee Globe in some rather big Biscay seas! Sister company Solent Rib Charter provided a fleet of Ribs for the start of the solo Round the World Race for Alex Thomson Racing. Alex went on to finish this epic race in 3rd position. 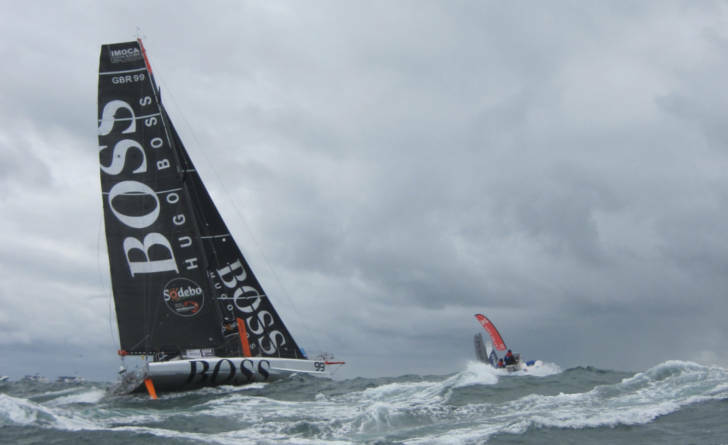 Alex Thomson Racing have been sponsored by HUGO BOSS since 2003, and have secured sponsorship until 2018. The team have chosen Guillaume Verdier and the VPLP Team to design the new HUGO BOSS IMOCA 60 which is due to be launched in summer 2015 with the aim of winning the 2016 Vendee Globe. We will look forward to the unveiling of the boat which is scheduled to be ready for the Transat Jacques Vabre 2015.